With the words "This is London,” Edward R. Murrow's groundbreaking radio broadcasts from 1939 to 1941 brought the blitz into America's living rooms. Countering the tide of U.S. Unfortunately, due to sales rights restrictions, we cannot offer Broadcasts From The Blitz for sale in your country. With the words "This is London,” Edward R. Murrow's groundbreaking radio broadcasts from 1939 to 1941 brought the blitz into America's living rooms. Countering the tide of U.S. isolationism, Murrow told his huge audience that the United States could not avoid a confrontation with Hitler and that the bombs it heard falling during his reports would eventually be targeted at American cities. But although often cited as the paragon of journalistic objectivity, Murrow had a clear agenda—to bring America into the war—and he slanted his broadcasts accordingly. And behind the scenes, he helped the British court U.S. public opinion and secure American funds for a British intelligence operation. 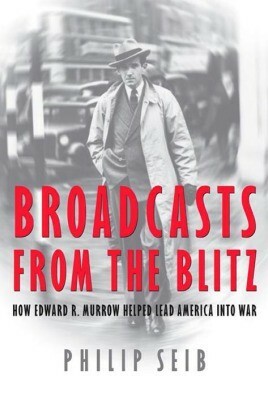 Broadcasts from the Blitz examines Murrow's work and life during this crucial time. It also profiles unsung heroes of those days, such as U.S. ambassador John Winant and Winston Churchill's confidant Brendan Bracken, and villains as well—such defeatists as Joseph Kennedy and Charles Lindbergh, who believed England was doomed. Other compelling characters include Eric Sevareid, Mollie Painter-Downs, and Nancy Astor, whose"Cliveden set” was accused of being too cozy with the Germans. They and many others mixed in a London that remained vibrant even as it was being battered. Broadcasts from the Blitz is a story of courage—of a journalist broadcasting live from London rooftops as bombs fell around him—and of intrigue, as the machinery of two governments pulled America and Britain together in a common cause. Finally there is the drama of December 7, 1941, when Murrow was the sole journalist to meet with Roosevelt. Broadcasts from the Blitz is for all those interested in the influential career of an extraordinary man and in the relationship between journalism and politics.